People often ignore the important reasons why you should eat breakfast as well as the consequences that come from missing this important meal. While some people have been raised to believe breakfast is the most important meal of the day, others have grown up eating a toaster pastry or piece of toast while heading out the door. It's not uncommon for these folks to develop similar habits as adults like skipping breakfast altogether or just enjoying a cup of coffee they grab from their local coffee shop on the way to work. 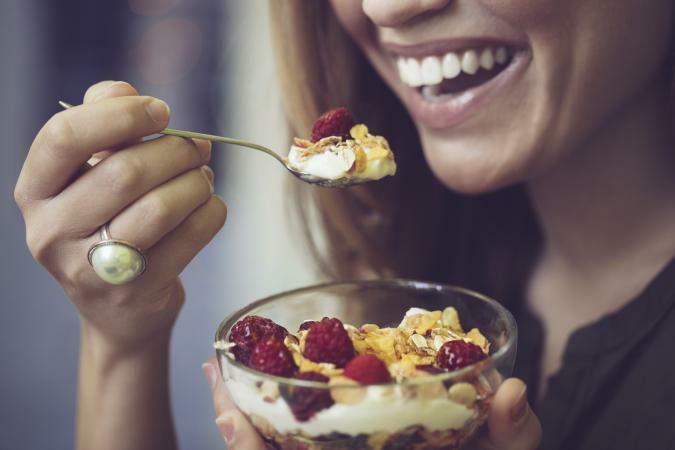 Another common reason people skip breakfast is in an effort to lose weight. On first consideration, skipping a meal makes sense. You're cutting calories, plus it gives you a little more time to hit that snooze alarm before facing the day. As much as this sounds logical, research shows that those who get up and eat breakfast are more successful at losing weight. Eating a bigger breakfast and a smaller evening meal helps the body utilize energy more efficiently. That's because eating breakfast provides your body with the fuel it needs to be more active and productive because it restores sugar levels. When you don't eat breakfast it can lead to an energy deficiency because you haven't eaten since dinner the night before. Skipping breakfast leads to slumps mentally and physically in those who skip breakfast. Feeding your body all the nutrients it needs to operate at peak efficiency is difficult without eating breakfast. When we lack good nutrition, our bodies and energy levels pay the price and we are less productive overall. If you want to lose weight, research shows that eating breakfast makes it easier to stick to a diet and to shed those unwanted pounds. Making breakfast part of your daily routine can boost your metabolism by as much as 10 percent. Breakfast helps with mental performance and enhances concentration. Eating breakfast can affect mood, too. When our bodies are hungry it can lead to irritability and mood swings. This not only affects you, but all the people who interact with you. Now that we understand the importance of breakfast it is just as important to understand what kind of foods to eat for breakfast. Let's fact it, stuffing a toasted pastry down your throat on the way out the door does not constitute a healthy breakfast. Choosing the right foods can help keep hunger at bay throughout the morning until you are ready for lunch. This cuts back on mid-morning snacking and/or eating a large lunch and can help you lose weight even though you ate breakfast. Making wise choices when selecting breakfast foods is an important factor in eating breakfast. You want to avoid high-sugar, high-fat foods, especially if you want to lose weight. How much you eat should be determined by how many calories you burn throughout your day, whether or not you exercise and whether or not you are trying to lose weight or just maintain your current weight. The National Weight Control Registry has tracked people who have lost 30 pounds or more and kept it off for at least one year. 80 percent of the people who have successfully lost weight and kept it off eat breakfast. Of course, eating breakfast isn't a magic bullet to get rid of unwanted weight. These people also followed a calorie restrictive diet that was low in fat.